Looking for a great spot to relax and try some of the tastiest wines, beers, and food in town? 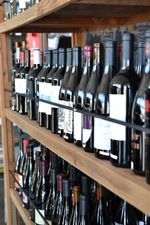 Manhattan Beach locals know that the best place to get personalized service on unique drinks and noshes is Barsha Wines and Spirits, a tasting room/wine shop on Sepulveda Boulevard. Barsha is owned by Adnen and Lenora Marouani, two chefs (one Tunisian, one a South Bay native) who wanted to create a comfortable place with an earthy, modern vibe - one that supports small, independent, and family-owned wineries and other suppliers. According to Adnen, tasting and shopping at Barsha is an entirely different experience from what you would get if you bought an off-the-shelf wine from the supermarket. "Other big stores may have more stuff, but it's generic. Here at Barsha, we try to take you outside the box," says Adnen. "You like Chardonnay? I'm going to give you this Muscadet from Loire. If you tell me you trust me, I will do my best to find you something you like." For wine tasting, you can choose from a series of wine flights, or else you can go by the glass in the "sip" (3-ounce) or "savor" (5-ounce) sizes. On the beer side, there's a robust selection of mostly local, artisan beers on tap. Adnen notes that Barhsa gets lots of small groups - book clubs, moms' night out, or the after-work crowd coming to hang out in the tasting room. "Sometimes people come in to shop, and then they see the tasting room, and then they wind up staying." The food offerings include hand-selected artisan charcuterie and cheeses, as well as salads, bread, and our personal favorite - the five-dip sampler (currant-olive tapenade, kale pepita pesto, Tuscan white bean dip, Tunisian harissa, and Tunisian olives. 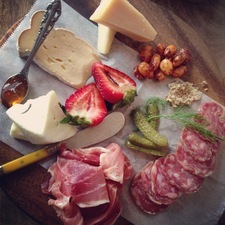 "We probably have one of the best cheese and salami selections in the South Bay," notes Adnen. 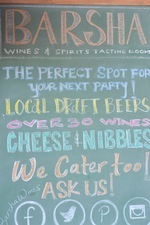 Barsha is also available as a private party space if you want to host a wine tasting for friends. Lately, it's becoming known as a go-to spot for school and non-profit fundraisers which Adnen and Lenora are proud to support. Want to become a regular? Sign up to be on Barsha's mailing list, and you'll get a personal heads-up about Barsha special events, which include regular visits from local specialty food trucks.